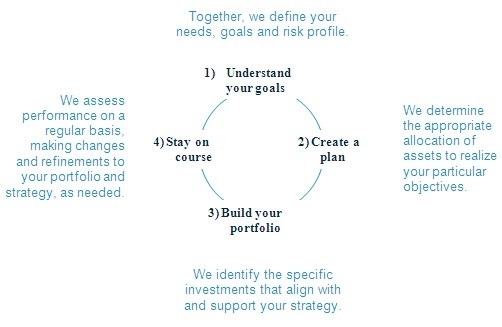 Investors must have a plan to reach their financial goals – it’s not just going to happen. To that end, we follow a disciplined investment management process that provides a structured approach, while allowing for customization as your situation demands. Our process is consultative in nature and will begin with establishing your financial goals and objectives. We feel that clients want to work with a competent, ethical, and caring advisor, and we intend to provide that experience. We’re passionate about developing meaningful relationships with our clients, having a positive impact on their lives and helping them achieve their financial goals.